Costa hints at United move? 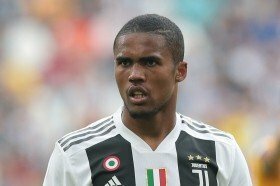 Juventus attacker Douglas Costa has hinted that he could favour a potential move to Manchester United when the transfer window reopens in a few months' time. The Brazil international signed for the Bianconeri on a permanent deal from Bayern Munich last year after impressing during his debut season with the Turin giants. However, he has since struggled to replicate the showing with just one goal from 17 league appearances and reports have recently associated him with a possible move to Old Trafford. Amidst this, the former Bayern man has dropped a transfer hint on social media by liking a post which has linked him with a switch to the 20-time English champions. Costa has since unliked the tweet but this may not quell the recent gossip which has tipped him to join United, who remain long-time admirers of his services. Juventus are currently said to value Costa at around £60m but that asking price may reduce during the forthcoming months with suggestions that they are prepared to offload him from their ranks.